Research on the effects of climate change on people and the environment has its roots in decades of study by archaeologists and meteorologists. 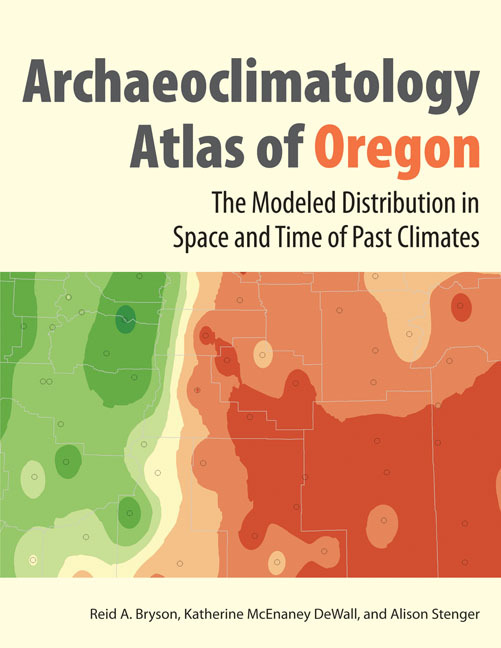 The Archaeoclimatology Atlas of Oregon provides an in-depth look at the modeled climatic and environmental history of the region over the past 14,000 years and analyzes the relationship between climatic variables and people in the past. The Macrophysical Climate Model (MCM) used for the atlas presents an innovative means of modeling past climate that has been rigorously tested and verified against field evidence worldwide. Broad-scale reconstructions of specific times in the past provide detailed site-specific graphs of precipitation, temperature, evaporation, and snowfall for more than 75 locations in Oregon. Applications of the model and its implications for human populations in Oregon are explored for each region of the state, demonstrating the variability of human-climate interactions. Reid A. Bryson (1920-2008) was an emeritus professor of atmospheric and oceanic sciences, geography, and environmental studies at the University of Wisconsin, Madison. He authored seven books and more than 250 other publications ranging over the fields of geology, limnology, meteorology, climatology, archaeology, and geography. His book, Climates of Hunger, received the Banta Medal for Literary Achievement. Alison Stenger is the director of research at the Institute for Archaeological Studies in Portland, Oregon. Her publications include British Impacts upon Native American Populations in the Northwest; Megafauna, Man, and Pathogens: International Travel in the Pleistocene. Katherine McEnaney DeWall is an elementary school teacher with a background in archaeology and degrees from Harvard University and the University of Wisconsin, Madison. She has published several articles applying Macrophysical Climate Models (MCM) to archaeo- logical questions, and is coeditor with Reid A. Bryson of A Paleoclimatology Workbook: High-Resolution, Site-Specific, Macrophysical Climate Modeling.